Being asked to be a bridesmaid or groomsman in a friend or family member’s wedding is a major honor, but it can come with a major price tag. Last spring, WeddingChannel.com estimated that the average cost of serving as a bridesmaid is now nearly $1,700. The cost for young adults to be bridesmaids or groomsmen, particularly ones who have been asked to stand in several weddings per year, can be so substantial that it’s reasonable to consider denying the request. Kyle and I did not want to overburden our attendants with time or money demands as several of them were also graduate students at the time and tried to put ourselves in their places to imagine what we would be able to do. Most of our attendants had to fly in to participate in our wedding so they had a significant financial expenditure from the outset. Our attendants were super supportive, helpful, and gracious to us during our engagement and in scrambling to finish up the wedding prep work the day before. I would hate to have added big financial stress on top of the general busyness of that weekend, so we tried to be sensitive to where we could keep their costs down without greatly adding to the cost of our wedding. In what ways did you or your bride/groom-friends try to keep costs down for the attendants? What is the best cost-saving tip you’ve heard for attendants? 20 Responses to "Easing the Financial Burden on Wedding Attendants"
We did a few things to keep our costs as low as we could. My wife did want matching outfits on the girls, but she chose a very affordable dress and shoes combo, which I know they appreciated. We also ‘requested’ bachelor and bachelorette parties which were very low key. No limos, no big events. Just a fun night out for each of us. I like the look of matching or nearly-matching outfits so I think you just have to read what they are willing to do. Do people get limos for bachelor(ette) parties?! My parents insisted on us having one at our wedding but we fought them on it. I don’t really see the appeal. this really hits home with me – I was in the wedding party for 3 weddings last year, and had my own this year, so it was very high in my mind when planning not to make it too expensive for my friends to get there – because i’d rather have them there than not. We choose a place that required travel (but was worth it) and for my attire, I choose a suit that I knew everyone had because we all wore it in one of the weddings that I was in the year before – that saved all my guys tons of money, and all they had to buy for my wedding was a tie that cost about $20. We didnt do anything elaborate for my bachelor party either – we went camping. It was an awesome time, even though not much money was spent! That’s great that you were able to use the same attire as the previous wedding! A couple of my bridesmaids have told me they rewore the dresses they bought for our wedding (one in another wedding) so that’s nice to hear. Camping sounds like a great bachelor celebration! I was a bridesmaid while in graduate school. As the bride was also in school, she just picked a color and let us wear what we wanted. It looked awesome and didn’t cost us much at all. We pooled our jewelry and borrowed them if we had to. Overall it was a very nice affair without costing anyone more than a $50. I wish I had considered this route for my wedding! I personally don’t own many dresses though so if someone asked me to do that so I might have ended up buying a dress anyway – but it’s definitely more likely to be reworn if you choose it yourself. My friend who is getting married next month not only bought my bridesmaid dress but is paying for the alterations. Wow, that is really above and beyond! Nowdays we really need to be practical. As we do not have to put all money just for one occasion. An occasion that will come out even though we dont have spend extravagantly. Sharing this article or tips will be an inspiration to others. Thanks for sharing. I definitely tried to keep that in mind while wedding planning, but more for stress control than spending reduction. I love what you did for your wedding. I serve weddings a lot, and I honestly think that it often is the case that they become obsessed with every little detail, and spend far more than needed. In the end, it’s going to be a great day regardless if you spend $10000 on flowers or not, and I am really happy to see you being so sensitive to your wedding party’s finances. I wouldn’t want to have to say no to a good friend just because I couldn’t afford it! MoneyAfterGrad recently posted..Is Debt a Dating Deal-Breaker? Thanks so much! We did partly fall under the wedding spending spell and obsessed about some details, though – it was a crazy time. But we just thought about what we would like if we were attendants in an out-of-town wedding and created some options for them. I’m generally quite libertarian, and my wedding was no exception. I opted out of the matching attire trend. Completely. “Wildflower colors – fancy material (lace, satin, silk, or chiffon), please – sleeves preferable”…. my mother, a southern belle, was outraged and thought it would be sloppy. 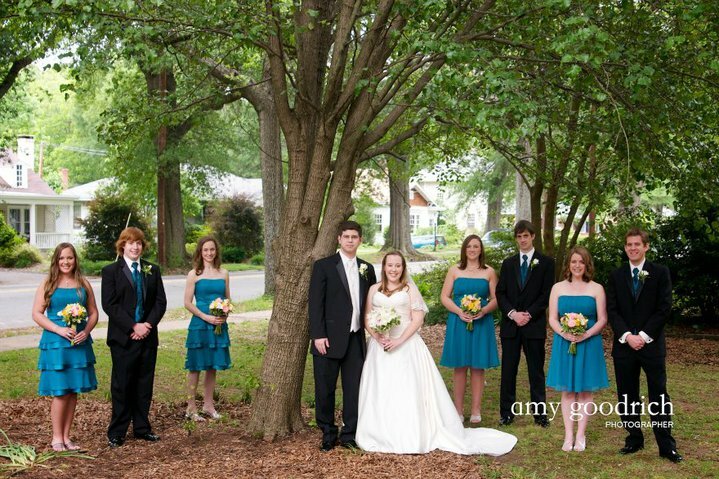 It certainly wasn’t picture-perfect, but they only stood in front for about 5 minutes, and I wasn’t planning on publishing the bridal party pictures anywhere except my own album…. so who cares?! One bridesmaid found her JCrew chiffon dress at a consignment store for $5. All the others cost <<$100. And they looked lovely!! Nails, hair, make-up was generally DIY. I will say that my bridesmaids are all very trendy gals, so I didn't have to worry about them. I think if I had a larger, more diverse party, I may have been a bit more specific. My parents had some objections to our wedding as well that they eventually got on board with. Sounds lovely! You can’t get more flexible than that. We’re not married, but whenever I’ve gone to weddings, I always like it when the couple has registered for a variety of gifts, small and large. I *want* to give a present, and it’s nice to have lots of options so that I can choose one within my budget. I feel the same way. We always get something off the registry, often a few smaller items.